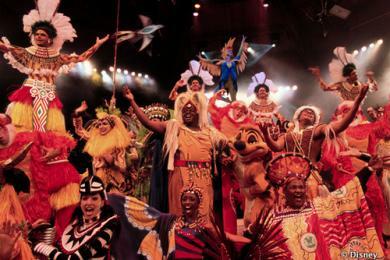 Festival of the Lion King features songs from the hit movie in addition to dancers, acrobats, floats, and a fire twirler. The current home of Festival of the Lion King in an enclosed and air conditioned theater in Camp Minnie-Mickey - the same place the show has been performed since it debuted in 1998. The show is performed year-round. Some internet sources speculate that the land occupied by Camp Minnie-Mickey will be taken up by the new Avatar Land. Disney has revealed few details about the proposed new section of the Park, however Disney Imagineers have hinted that fans will get "teasers" for Avatar at the upcoming D23 Expo in Anaheim later this month. I look forward to seeing the new theater - I hope that it's a nicer permanent home for the Festival of the Lion King. My kid love this show, and it was one of my mother's favorites.